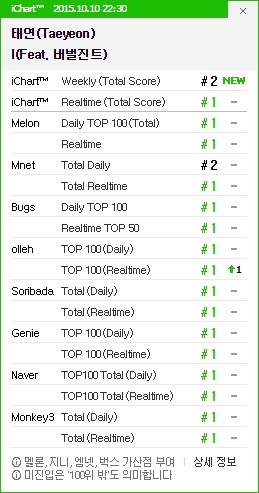 Taeyeon's solo debut track "I" is popular enough to ensure all-kills on the digital charts. The singer's first solo mini-album "I" was released on October 7th. As of October 10th at 10:30pm KST, the Girls' Generation member topped the #1 position on all digital charts; both real-time and daily. A music video for the title track was released soon after the mini-album hit the stores. Fans were generally supportive of the singer's music video, praising it for the aesthetic appeal. Be sure to check out the music video below, and to purchase the mini-album via iTunes.